Class Guitar I (Non-Music Majors). Two classes per week. May be retaken to a maximum of 4 hours. Music minors may also enroll into private lessons (MUS132F) for one credit hour. Non-music majors/minors may enroll into private lessons (MUS 132F) after 4 semesters of MUS 107. Students who declare a music minor in guitar are required to complete one semester of MUS 107. Provides basic instruction in the essential elements of guitar playing in a format accessible to all students. The ability to play guitar and a prerequisite knowledge of music is NOT required (or expected) for this course. Consider declaring a music minor if you are an experienced guitarist who is already familiar with music notation and want to take private lessons (MUS132F). All students must have an acoustic guitar for this course. This course requires five hours of practice time each week (minimum). Exercises, songs, and assignments are cumulative and should be practiced every week without reiteration. The weekly submission of practice journal entries will begin on the third class. Required Concerts: You are required to attend the EKU Guitar Studio Concert and the EKU Guitar Ensemble Concert. You are also required to attend one of the other concerts. Please resolve any conflicts with me during the first week of class. Note: an unexcused absence from a required concert will lower your semester grade by one letter. Please look at your schedule immediately and place these events in your electronic calendar. You need to take a concert attendance card from the usher when you arrive, fill it out, and personally give it to Dr. Davis at the conclusion of the concert to receive concert attendance credit. 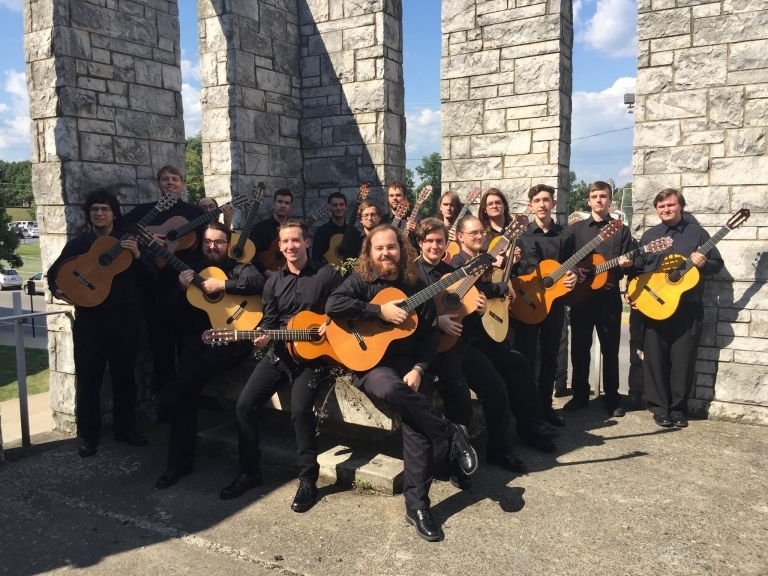 EKU Guitar Ensemble Concert: March 26, 2019, 7:30PM, Gifford Theater. EKU Guitar Studio Concert: April 30, 2019, 7:30PM, Gifford Theater. Extra Credit Concerts and Opportunities (5 final grade points): Extra credit opportunities (see Blackboard activities and deadlines) may arise serendipitously during the semester. Any "optional" concerts listed above that are not required may also be used for extra credit. There are also guitar instructional DVDs that may be reviewed for extra credit. A list is available upon request. EKU Student Degree Guitar Recital: Guthrie Green & Stuart Jones, Joint Junior Recital: April 10, 2019, 7:30PM, Pearl Buchanan Theater. Students will learn how to read music notation using the guitar. Students will be able to demonstrate proper posture, hand position, and technique. Students will learn how to practice music effectively. Students will gain the ability to perform solo and ensemble works for guitar. Students will learn music theory and the history of the instrument. Students will learn the basics of improvisation. This is a beginning guitar class, so students are not expected to know anything about the guitar or be able to play the guitar. For most, it is not really possible to play the guitar well after just one semester of study. That is why students are advised to repeat this course and improve each semester. Students interested in more advanced classes need to meet with me and discuss how to minor or major in guitar at EKU. This course is designed to fun, but it does take work and effort to progress on this instrument. Students are graded according to how well they progress from whatever point they are at when they begin this class. However, attendance is mandatory. Please note that three unexcused absences will result in a failing grade for this course. Each unexcused absence will result in a 3% reduction of your final grade and each late arrival will result in a 1% deduction of your final grade. The total for these deductions will show up in your attendance gradebook column in Blackboard (-3 equals one absence and -1 equals one late arrival and these numbers are totaled throughout the semester in the Attendance column). You may view "grade details" for more information about the entries in this column. Absences with proper documentation (Dean/Medical Excuses) will be excused and decisions about excusing other absences will not be made until the end of the semester. Unexcused absences occurring for exceptional and non-repetitive reasons (with documentation) will also be considered and probably excused, but only on a case-by-case individual basis. The attendance column in your Blackboard Gradebook keeps a record of absences and lateness. Weekly Participation, Written Assignments (in text), and Practice Assignments: 25% of your grade. Class participation is the primary method for assessing student progress. Class participation is also the best way to learn how to play guitar. So, again, attendance is mandatory. Students will suffer point deductions for not doing their homework, failing to bring the required materials, or not adequately practicing the assignments. Even if you are unprepared and have not had time to practice, it is crucial for you to still attend this class. Practice Recordings, Blackboard Assignments, Musictheory.net and other announced or unannounced Quizzes and Assignments: 25% of your grade (as assigned). Practice recordings are equally beneficial and you should make them every week and upload them to our shared Google Drive folder. Be sure to record your technical excercises every week after we cover them (Shifting, Pull-Offs, Hammers, and Coordination). Whenever we cover a new item, you should add it to your recording assignments until perfected or otherwise assigned (i.e. Blues in A, Chords, Ensemble literature, and Songs). Mid-Term Exam: 25% of your final grade. Final: 25% of your final grade. Missing a required guitar concert will lower your final grade by one letter (per event). Missing your own concert at the end of the semester (see schedule below) will result in a failing grade for this class. Be sure to add the required events listed above to your personal calendar and discuss any conflicts with me during the FIRST WEEK of classes. Student Progress: The instructor will provide students with information on their progress in the course at least once prior to midterm and grades will be posted on Blackboard. The last day to drop this course or to withdraw from the University may be found in the Colonel Compass. You MUST have your own acoustic guitar for this course and you must bring it to every class, along with your course materials. Please not "borrow" the guitars hanging on the wall. They are for music education majors. You also need to own some picks for learning contemporary music. I am writing a new text for this course. Students will not be charged for this text, but they will need to print it, punch holes in it, and organize it in a binder. Please purchase a Black Binder for this course. Please go to Blackboard and print the free text before our second class on Thursday. Other supplementary materials will be copied and provided for free, as needed, and should also be organized into your course binder. Metronome (approx. $15 or use a free smartphone app). Students are required to purchase a footstool for this course. It is approximately $10 at Sweetwater Music (sweetwater.com) with free shipping (use the "footstool" link above). Practical Theory by Sandy Feldstein (10.95 plus tax): Provides non-music majors an introduction to music theory and harmony. Mel Bay: Basic Chords for the Guitar (4.95 plus tax): Chord diagram reference book. Music Library (Foster Basement): Articles and videos explaining guitar technique, along with videos and CD recordings. Blackboard: Various instruction materials, videos of the exercises, practice recordings, and other items of interest. We will need to create a shared folder in Google Drive. Go to your EKU Google Drive (http://it.eku.edu/gsuite_drive) and create a shared folder titled "MUS107-LastNameFirstInitial" (i.e. "MUS107-DavisD") and share it with me with editing privileges. Various assignments are also in Dropbox. Dropbox is free and if you do not have it, you may use this link to get it (https://db.tt/IoRYYLPc). 3) Begin the Smoke on the Water Music Symbols Quiz. 4) Begin reading the assigned practice articles. Parts of the Guitar: Complete In-Class Assignment. Quick-Start Rote Session: The Blues in A. Introduction to Basic Sitting Position and Hand Positions. 12 Basic Chords (Practice Writing Assignment Only). Begin studying the Practice Articles. Blues in A (if time permits). 1) Complete Sitting Position, Right- Hand Positioning, and Pick Positioning Quiz. 3) Complete the Smoke on the Water Music Symbols Quiz. Review Questions: Guitar Parts, Sitting Position, Right-Hand Positioning, and Pick Positioning. In class quiz on "Parts of the Guitar." Are you able to correctly label all of the parts of an acoustic and an electric guitar? Can you explain and demonstrate a proper sitting position and its triangle? Can you explain and demonstrate a proper finger-style playing position and its triangle? Can you explain and demonstrate the proper way to drive the string with the fingers by using a “rest stroke” (hint: back-flexing)? Can you explain and demonstrate how the top of the guitar vibrates (as shown in class demonstrations)? Can you explain and demonstrate the three different positions for playing with a pick, including the pick grip, pick angle, and lengths of pick for single string, multi-string (comping), and strumming? Have you memorized the symbols for the down stroke and the up stroke? Review Questions: Left-Hand Finger Numbering and Positioning and Three Technical Exercises. Are you able to correctly label the left-hand fingers? Can you explain and demonstrate the four main points of left-hand positioning? Can you explain and demonstrate the three different technical exercises: 1) Shifting, 2) Ascending/Descending Slurs, and 3) Coordination. If you have not memorized these concepts, please study them and quickly memorize them. Learning the guitar is a cumulative process and students need to be sure of these basic concepts and procedures before continuing. The Written Language of Music (through notes on the first string). 1. Be sure to memorize that A=440 did not become standardized until 1939 and that Equal Tempered Tuning did not become established until the early 1800s (J.S. Bach). It is also important to remember that earlier tuning methods, such as Meantone and Pythagorean, made it impossible to play music in all twelve keys. 2. Be able to tune your guitar using any method of your choice. 3. Be able to set the high string of your guitar to the proper pitch with the device of your choice and then use the Stopped Unison Method to tune the other strings in their proper order. 4. The harmonic tuning method is not required until the final exam. Review Questions: Tablature & Notation. 1. What are the primary letters in the musical alphabet? 2. What are the pitches of the A minor scale (hint: what are the letters of the musical alphabet)? 3. Besides those primary letters, what other symbols are needed to complete the twelve notes of the Chromatic Scale. 4. Be able to supply the missing pitch names and fret numbers on a notation and tablature diagram. 6. Memorize the notes in first position by working from the open strings to the other pitches. The Written Language of Music (through notes on the second string). The A Minor Pentatonic Scale and Basic Improvisation. Extra Credit Paper Due: William Kanengiser, Effortless Classical Guitar DVD (Music Library Reserve). The Written Language of Music (through notes on the third string). Introduce Come Together by the Beatles. Continue the Blues in A, the A Minor Pentatonic Scale, and Basic Improvisation. Continue Come Together by the Beatles. The Written Language of Music (through notes on the fourth string). Power Chords: Introduction and assignment of two of the several Power Chord Riffs listed in this section. Introduce Strumming Pattern for 12 Basic Chords. The Written Language of Music (through notes on the fifth string). Study the prior review questions, know the terminology, and be able to demonstrate important concepts. Be able to label the parts of the guitar. Be able to perform the three Technical Exercises. Be able to tune your guitar and know the important points discussed in that section. Be able to identify and perform the rhythm and notation elements covered to this point. Be able to perform the Blues in A. Be able to perform the Chromatic and A Minor Pentatonic Scale (E form and G form). Be able to play Chanson Russe. Be able to play the assigned sections of Come Together. Know all of the pitches on the guitar in the first position. Be able to play the exercises for the notes on strings 1-3. Perform one Power Chord Riff. Be able to write and perform the 12 basic chords and the strumming pattern. Distribute post Midterm supplements, if not yet already received: Take it Easy, Allemande, and Balletto. Review and Discuss Mid-Term Exam Scores. Continue the Blues in A, the A Minor Pentatonic Scale, Basic Improvisation, Chanson Russe, Come Together, and Power Chord riffs. Rehearse the Strumming Pattern assignment for the 12 Basic Chords. Ensemble Session & Assignment: Smoke on the Water (study the new notes and rhythms and practice part 3). Introduce Take It Easy by the Eagles (chord Strumming). Introduce the C major two octave scale. Continue Take It Easy by the Eagles (chord Strumming). Play the C major two octave scale. Continue all prior activities, including the single string exercises, Blues in A, the A Minor Pentatonic Scale, Basic Improvisation, Chanson Russe, Come Together, Power Chord riffs, and the Strumming Pattern assignment for the 12 Basic Chords. The Written Language of Music (through notes on the sixth string). Introduce the CAGED system and discuss how to create Barre Chords. Continue Smoke on the Water and Take It Easy by the Eagles (chord Strumming). Continue CAGED system, review Barre Chords, and pass out the other Pentatonic Scale Forms. Introduce Estudio in A Minor by Dionisio Aguado (Planting and Block Chord Practicing). Continue CAGED system and review Barre Chords and other Pentatonic Scale Forms. Continue all prior work. Perform prior technical exercises, scales, songs, and ensemble works in class. Rehearse and Analyze Estudio in A Minor by Dionisio Aguado (Planting and Block Chord Practicing) and use it and the C major scale to explain the construction of chords and basic music theory. EKU Guitar Ensemble Concert (Extra-Credit Opportunity). Continue to Rehearse and Analyze Estudio in A Minor by Dionisio Aguado (Planting and Block Chord Practicing) and use it and the C major scale to explain the construction of chords and basic music theory. Introduce Elderly Woman by Pearl Jam and strumming in triple meter. Review and rehearse for the Final Exam and Concert. Continue Elderly Woman by Pearl Jam and strumming in triple meter. Extra Credit Topic: Introduce Bob's Blues and the Dead Thumb Style. 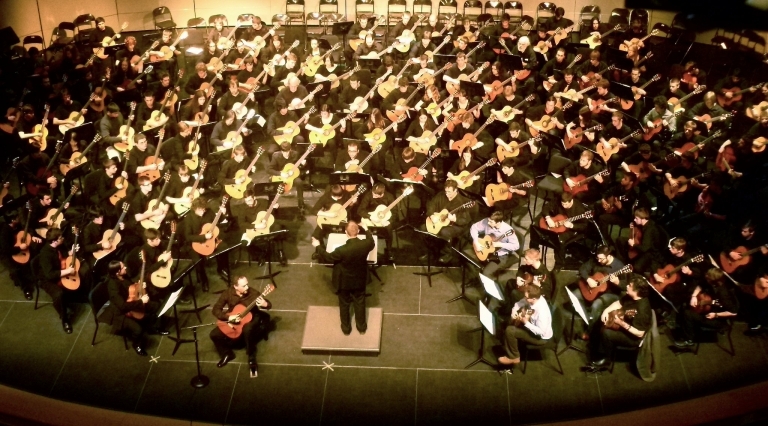 Reminder: 4/30/19 (7:30 PM, Gifford Theater): Perform ensemble selections during the EKU Guitar Studio Concert. Arrive 1 hour before the concert to practice stage entrances and exits. Wear black pants, dress shoes, socks, and a long-sleeved shirt. Have your ensemble music in concert order in a black three-ring binder. Final Exam: 10:30-12:30 pm. Room: Campbell 327. The University strives to make all learning experiences as accessible as possible. If you are registered with the EKU Center for Student Accessibility (CSA), please obtain your accommodation letters from the CSA, present them to the course instructor, and discuss the accommodations needed. If you believe you need an accommodation and are not registered with the CSA, please contact the office in 361 Whitlock Building by email at disserv@eku.edu or by telephone at (859) 622-2933. Upon individual request, this syllabus can be made available in an alternative format. A student with a “disability” may be an individual with a physical or psychological impairment that substantially limits one or more major life activities, to include, but not limited to: seeing, hearing, communicating, interacting with others, learning, thinking, concentrating, sitting, standing, lifting, performing manual tasks, working. Additionally, pregnancy accompanied by a medical condition(s), which causes a similar substantial limitation, may also be considered under the Americans with Disabilities Amendments Act (ADAAA). Academic Integrity Statement: Students are advised the EKU’s Academic Integrity policy will strictly be enforced in this course. The Academic Integrity policy is available at www.academicintegrity.eku.edu. Question regarding the policy may be directed to the Office of Academic Integrity. According to the EKU registrar: "Students who have not yet activated their EKU email account should do so ASAP and monitor that account regularly as it is an official means of communication between students and the university." Please power down your personal devices before class starts. Class disruptions will lower your final grade by one percentage point for each occurrence. Please warn me ahead of time if you think that you may need to take an urgent call. Please ask my permission if you wish to record my class. You may leave the class any time that you need to use the lavatory.